Four weeks of competitions are over and they went so so well! In the beginning of January I visited together with my boyfriend Marco Colorado in the US. 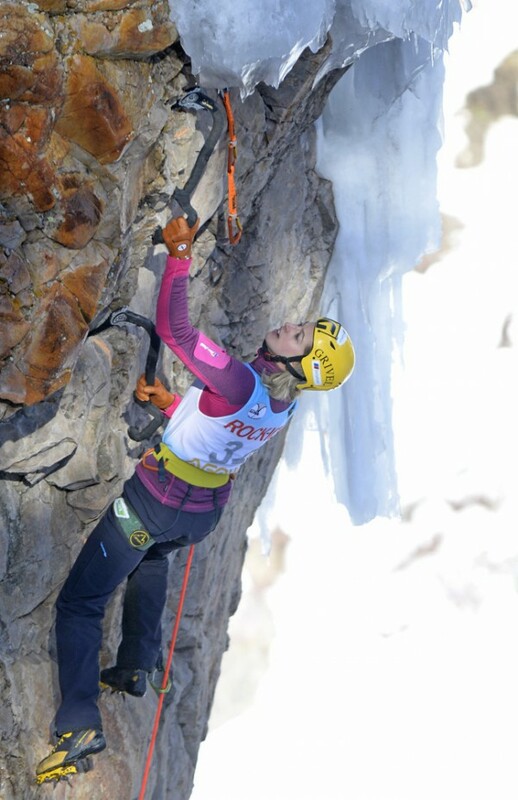 We spent some days Mixedclimbing in Vail and then moved to Ouray, where we did some iceclimbing in the fantastic canyon and I participated at the famous Mixedclimbing Master during the 20th Ouray Iceclimbing festival. I heard of this competition since years and so this year I decided to not participate in one Worldcupcompetition but go to Ouray, and it was definitely worth. The festival was great, people were super friendly and I won the womens competition and placed second overall!Back in Europe I participated in the Worldcup in Saas Fee Switzerland, which is one of my favourite events, organized inside a big parking lot and one of the highest structures in the circuit. Here I won my first Worldcup stage in 2008, my first Worldchampion title in 2009 and this year I could again express all my endurance and win this competition for the 5th time. One week later the most important competition of the year, the Worldchampionship in Rabenstein, close to my hometown Merano had come. It was a week ful of excitement and nervousness, everybody from the organizers, to the media expected me to win my fourth Worldchampion title at home. In the finals I climbed concentrated, without mistakes and fast, being motivated a lot by the cheering of my home crowd. I finished the route with one minute of time left but my friend and opponent Shin Woonseon from South Korea was faster and so I came second. I’m happy about this silver medal as climbing well with all the outside pressure and my own high objectives was not easy and I’m very satisfied to have done such a nice competition at home. This last weekend the Worldcup moved to Champagny en Vanoise in France. The icetower there is very nice, ful of vertical and overhanging ice and in a beautiful mountain ambience. After spending tons of energy and concentration at my homecompetition in Rabenstein I felt quite empty and it was hard to gain again mental power but by the finals I made it and so I gave it all. So I won for the first time the Worldcup at the Amazing structure of Champagny en Vanoise!Now there are four weeks off from competitions, witch I will spend drytooling, iceclimbing and starting a bit into the rockclimbing season before we travel to Russia for the last Worldcup stage. At the moment I am the leader of the ranking and so I will try to give it all once again in Kirov.